BQDN.com broker James Booth booked his latest 6-figure sale this week, one that put him at the top of our latest weekly all extensionTop 20 Sales Chart. Booth snared the honor by closing a $135,000deal for Snake.com, a sale that also ranks among the ten biggest sales reported so far this year. That sale and Sedo's $65,500 sale of #2 FusionBank.com helped the .coms sweep 15 of the 20 chart entries, but every category had reason to celebrate. The ccTLDs had their biggest sale of the year to date and two more that rank in the category's top five for 2019. The non .com gTLDs also got into the act with two sales that rank among the year's top five in that group, one of which was a new gTLD to essentially cover all of the bases. All three of those country code sales landed in the top ten on the all extension list with the new ccTLD King of the Hill, #3 Smart.co, leading the charge at $52,820. 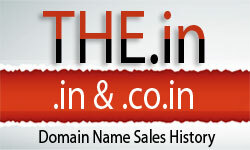 The seller was Aishwin Vikhona (Aishwin.com) who used Uniregistry's brokerage services to get the deal done. UnicDomains.com put IG.ca in the #6 slot with a$34,000 sale at Afternic and Sedo rounded out the country code power trio with #8 Hampton.co.uk at $32,750.